Scroll to the bottom right of your page to Add a Block. Select the Mass Actions Block from the list. 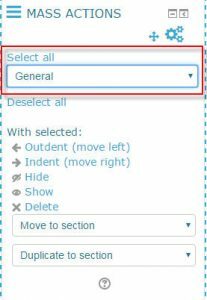 OR use the Mass Actions Block itself to Select ALL or All items in a particular section. 2. Once items have been selected, choose what you would like to do with the items.